It would seem impossible. Absolutely impossible. There could be no way. How would one choose a bottle of wine to symbolize the culmination of thirteen years? More actually. To treat myself to a special glass after an even more special occasion—the youngest child’s graduation from high school—was my goal. This was the first of many special life milestones for him, yet a very important one. Made more so by the fact he was one of the class’s co-valedictorians, a goal he set for himself when he first started high school. So very special for our son. Yet, my husband and I wanted something for us to toast each other, as well. After all the work of the reception, the day, the week…maybe even the years. My philosophy of parenting has always been “it’s about the kids, not about the parents.” However, my spouse and I wanted just a moment to share between the two of us. No children involved, just an extraordinary glass of wine. So, when I walked into a Rapid City, South Dakota liquor store—Canyon Lake Liquors—imagine how thrilled I was to find a bottle of Red Cap Vineyards 2006 Cabernet. It fit my criteria exactly. The perfect balance between my husband’s bold palate and my slightly more reserved sense of taste. A well respected, yet small producer. A great story behind the production of the wine. A label that featured a young boy on a tree swing—perfect for the parents of a boy who was no longer that young. I had been following certain wine lovers on social media for some time; this was how I originally got turned on to Red Cap Vineyards. The more research I did the more I wanted to find a bottle. However, located in the remote area of Howell Mountain in Napa Valley with no tasting room and most of its limited 280 cases a year sold through select distributors in just a few states, I was pretty sure I would never get my hands on a bottle until I went to California this summer. After the initial shock of spotting the boy on a swing from the Red Cap label, I snatched the bottle from the shelf as if someone might grab it away from me, marched to the register, and purchased it as fast as I could! I was so excited about my acquisition, I really didn’t pay much attention to the selection until I got home. After I was safely away from any crowd that might steal my rare wine find, I looked more closely at the bottle. Again, another surprise awaited me: this was a 2006—the first vintage Tom and Desiree Altemus and winemaker Rudy Zuidema made from their vines planted on Howell Mountain. In addition to the year being special for the vintage, it also was great timing to open the wine since it had some time to age in the bottle. At the end of the day on Sunday, after decorating for the party, getting dressed up, waiting for commencement, sitting nervously through my son’s speech (he did great, by the way), hugging other graduates, eating tasty food, saying thanks to well-wishers, cleaning up the aftermath, and watching my grad open gifts, my husband and I were finally ready to relax. Heels came off. The bottle was opened. The wine was poured, swirled, sniffed, and sipped. And delicious. Absolutely delicious. In the glass, the deep, inky, chokecherry-red made beautiful tears as it ran down the sides of the glass. On the nose, the smells of fig, spice, earth, and ginger came through. On the palate, the baked plum led to tannins that smoothed to velvet over the tongue. The finish was all fruit and lasted forever. I enjoyed the glass so much, that I actually became a bit of a wine hoarder, only allowing us to have a smaller glass that night. I wanted a glass the next night, too! Yes, it was so nice, I wanted that bottle to drink from twice. So we poured the next night as well. Being opened for twenty-four hours changed the wine, but only slightly. I think the tannins were more approachable on the first sip; they were smoother the instant they hit the palate. The fruit and spice were still complex in the mouth, and the finish still seemed to last an eternity. Though it may seem impossible, a special occasion really does deserve a special wine. One that maybe took a little bit of a search and a lot bit of luck. This bottle does not have to be the “perfect” bottle, it just has to be the perfect one for that specific occasion. It has to be one that matches the gravity of the celebration, one that represents the people and places and memories of the milestone. 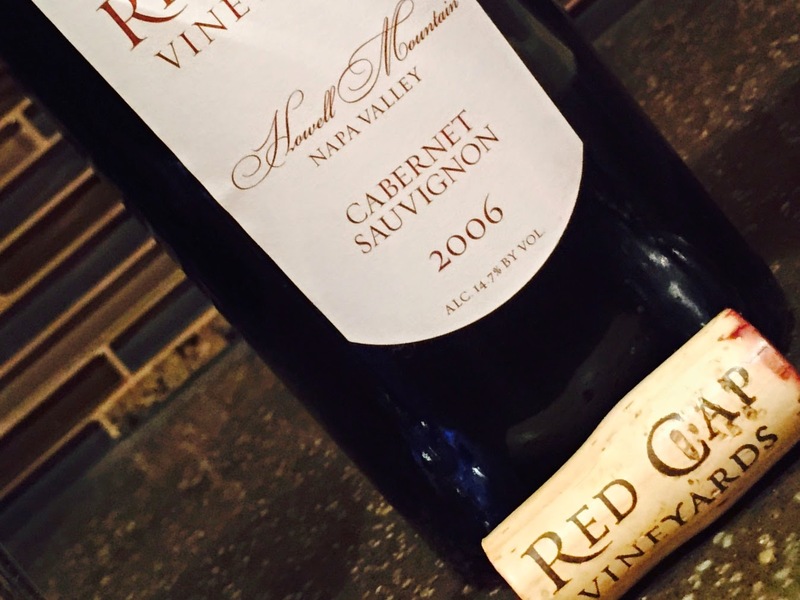 Just like our Red Cap Vineyards 2006 Cabernet, the bottle will become a part of the memory itself. A reason to smile because it evokes memories on its own. I truly feel honored to have scored such a unique find for my husband and I to toast each other on our youngest’s high school graduation. A wine that is as special as he is. A wine that will forever make me think of my son on his first of many “adult” accomplishments.